No doubt that Fortron/Source is a trusted name in power supplies. They are used largely in OEM's. In fact, FSP power supplies are in the AOpen cases I build up every day. 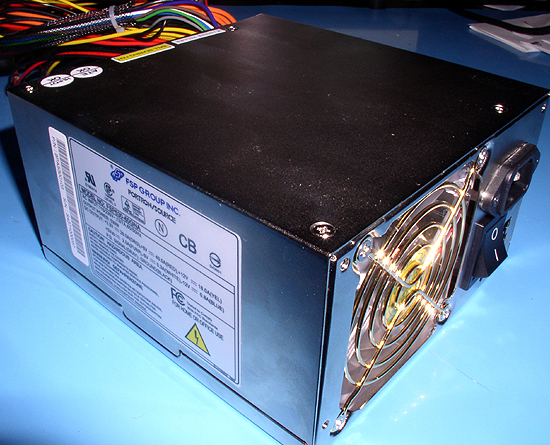 FSP also manufactures power supplies for a number of other companies like Zalman and supposedly PC Power and Cooling's Silencer series of power supplies. One of the best things about buying an FSP power supply is that you know you're getting a quality unit, that will not cost you an arm and a leg. As far as appearances go: The FSP530-60GNA we're reviewing today isn't going to make your head do double takes. It does have a nice nickel plated finish (reminiscent of my old 1981 Mongoose Team Edition BMX bike.) The cables are typical, with a nylon sheath over the main ATX power connector.